$175 – Will be for sale and ready to ship this fall following the AQS Quilt Show in Des Moines. Earlier this year I was taking my toddler to play at English Landing Park in Parkville, Missouri when we stumbled upon a car show they were having in the parking lot. 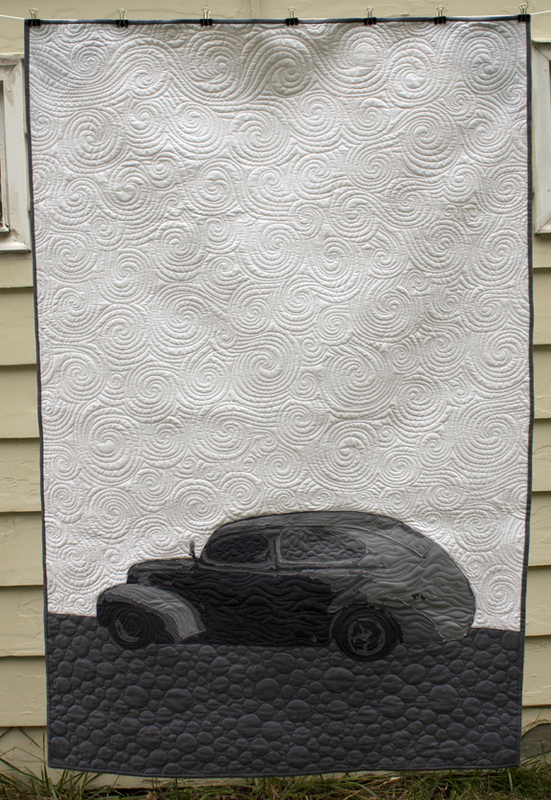 I took photos of the cars that I thought were interesting & I made this quilt from one of them. In real life this car is a screaming orange color, but I like it better in the shads of grey. I love the way the pebbling turned out on the bottom of this quilt. It gives such a nice texture. The swirls in the background make for such a nice sky. All of the quilts I make to sell that I think might be used as wall hangings come with two pockets in the upper corners are the backside. This is to make it super easy to hang the quilt. All it needs is a dowel or thing board cut to the width of the quilt (minus the binding) and inserted into the pockets. I like to use a very thin board and rested on two t-pins poked into the wall to hang quilts in my house. 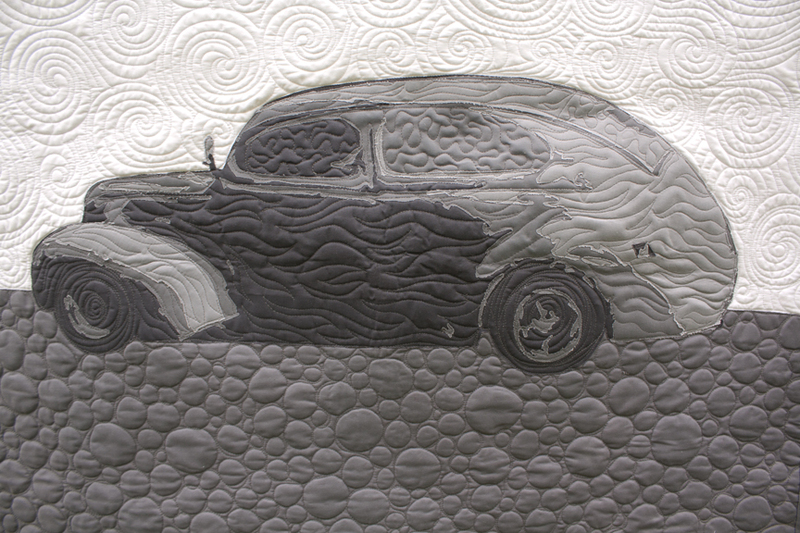 This quilt is going to be part of the Quilts of Classic Cars & Trucks at the Des Moines AQS Quilt show this fall. This is sure to be a fun exhibit. This year is the 55th anniversary of the plane crash that killed Buddy Holly, Richie Valens, and The Big Bopper. 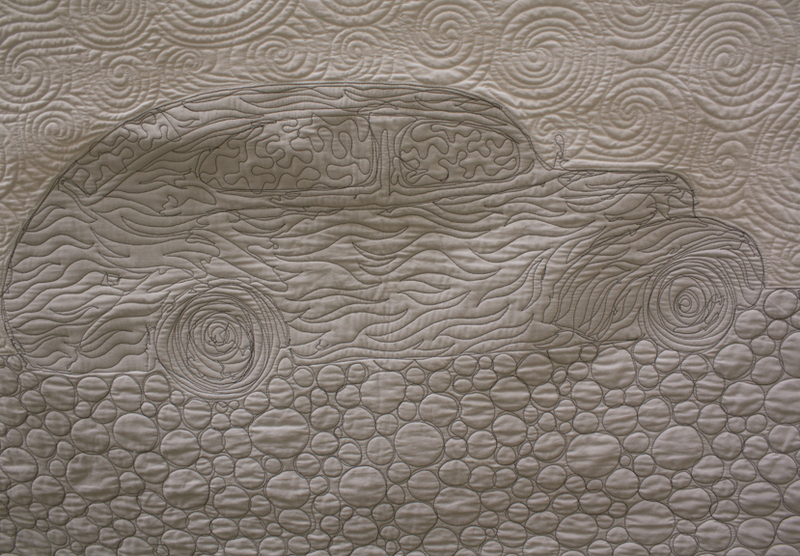 My understanding is the quilt show is a Rock ‘n Roll theme and this exhibit is being put together to complement it. Once it’s returned from the show, it will be listed for sale in the etsy shop. 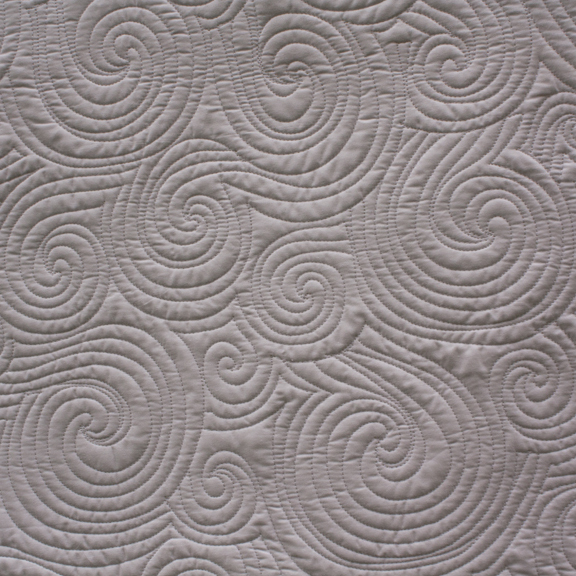 If you’re interested in purchasing this quilt or any of my other work, visit my etsy shop to see my current selection. This quilt will be for sale soon and the listing for it can be found here.